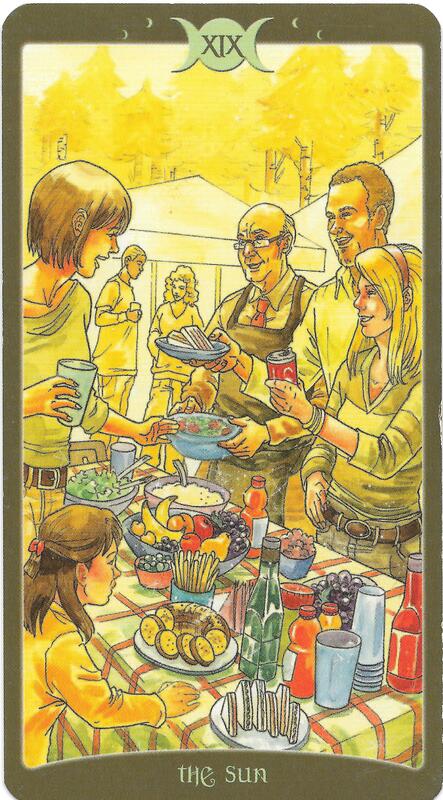 It’s the 29th week of the year and the card of the week is the 10 of Pentacles. This week is about potential and karma. Only when we correct the mistakes of the past in this life and former lives can we move forward. 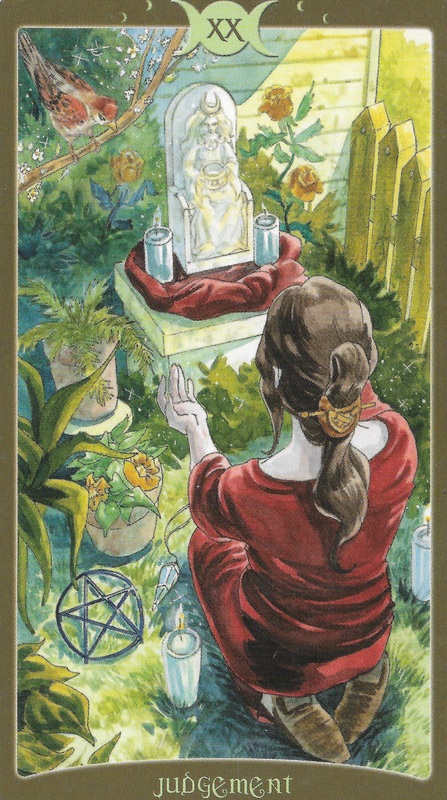 Do whatever you can to make things right and you will find the abundance of the 10 of Pentacles suddenly flowing to you. It’s the 29th week of the year which in numerology, adds up to 3. Things are coming together in big, exciting ways. Are you ready for it? Mantra: I’m ready for success. The Page of Swords is a card that appears when you feel like you can go out and get whatever you want. This energy brings an exciting exchange of ideas to the table. However, immaturity often surrounds the Pages so these ideas may be idealistic and not necessarily sustainable. Moon trine Uranus at 1:57AM PST will find you looking for excitement through new experiences and connections. This transit has a potential to bring big surprises with it as well. If you are asleep during this transit, these themes may present themselves in your dreams. The Moon goes void of course between 1:57 AM and 12:33 PM when it enters the sign of the teacher, Capricorn. If you are feeling the energy of the Page, you may attract a mentor today. Or if the shoe is on the other foot and you meet someone with a unrealized potential today, you may take them on as a student or mentee. The number of the day is 6, a number of victory. Mantra: When the student is ready, the teacher will appear. The Neptune ruled Moon appears when the shadow self emerges from the subconscious mind. You may become uncomfortably aware of your weakness or someone may even try to exploit them. Moon sextile Neptune at 10:37 AM PST encourages you to follow your intuition when you’re not sure what path to take. Moon conjunct Pluto at 6:24 PM PST could bring overwhelming emotions that could leave to obsession. Beware of those who may try to manipulate you to get their way. Mercury trine Saturn at 11:28 PM PST will bring mental clarity. Burning the midnight oil will allow you to organize and take on tasks that need your attention. The Moon is in Capricorn, the sign of karma. Anything that comes to the surface today has presented itself as a way to clear up mistakes you’ve made in the past. The number of the day is 7, a number of reassessment and re-evaluation. Mantra: The Light must be made conscious of the darkness in order to heal it. Whereas the Moon appeared yesterday to illuminate the our shadows and show us where we need to fix our karma, the Sun is about highlighting the strengths you have to take on that work. The challenges you faced yesterday are gone. The darkness has been chased away by the dawn. Moon trine Jupiter at 1:39 AM PST will bring creativity and good luck. If you are asleep during this transit, these themes may appear in your dreams. Moon square Uranus at 10:06 AM PST will find you empowered and ready to break from the norm. Moon sextile Mars at 12:12 PM PST brings confidence, bravery and leadership. Moon opposition Sun at 3:56 PM PST could bring a burst of energy that has the potential to wear you out. Don’t over work yourself. Full Moon in Capricorn will give you a chance to look at how your goals you set during New Moon have blossomed. The Moon goes void of course at 3:56 PM PST so if you’re planning any ritual work for the Full Moon, wait until She enters the revolutionary sign of Aquarius at 8:10 PM PST. The number of the day is 8, a number of movement and change. Mantra: What was empty has become full again. I was in darkness but now I stand in the light. 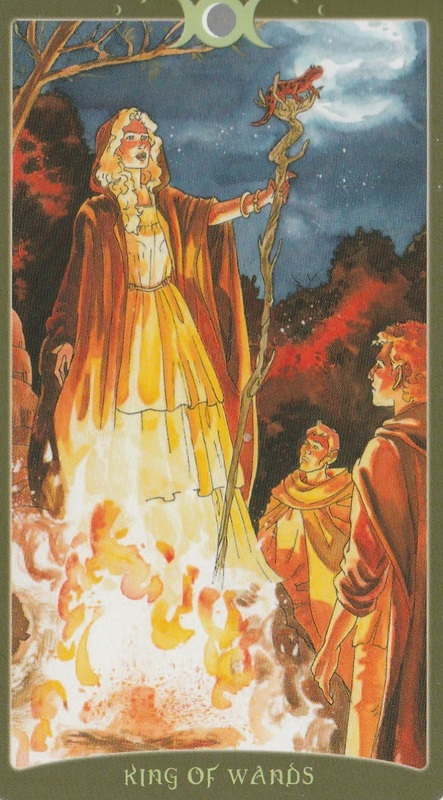 When the King of Wands appears, he has the fire and passion to change his world with a wave of his wand. He not only has a vision but lives his vision. Venus trine Saturn at 6:20 AM PST will bring satisfying interactions in your relationships. You will be able to get problems out in the open that need to be addressed without meeting too much opposition. Moon sextile Saturn at 2:34 PM PST will help you approach all tasks with a level head and a logical mind. Moon opposition Venus at 3:26 PM PST may find you feeling lethargic and lazy after a busy morning and early afternoon. Unfortunately, if you need to catch 2nd wind, Moon opposition Mercury at 8:28 PM PST won’t bring that wave of energy you desperately need. The exhaustion you feel may cause a conflict between your head and heart and your logic may go out the window. If possible, spend time alone and enjoy some peaceful solitude until your head clears. The Moon is in the revolutionary sign of Aquarius today, bringing with it a burst of energy that urges you to get out and try new things. Just remember that the time to socialize is earlier in the day and the evening is meant for you to spend some quality time alone. The number of the day is 9, a number of endings becoming beginnings. Mantra: Let your dreams become reality. 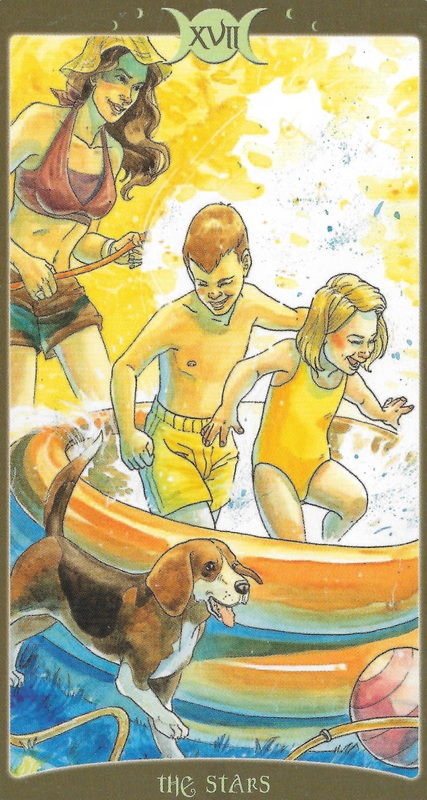 The 3 of Wands is the card of expanding into the future. The vision has been realized, the plans put into action and everything is in motion. It is only a matter of time before the desired outcome is manifested. Moon sextile Uranus at 3:54 PM PST will leave you craving excitement and adventure. You will want to seek out fun loving people and get the most out of your late afternoon and early evening. But be careful how far you go out of your comfort zone because Moon square Mars at 6:56 PM PST may leave you feeling pugnacious and irritable. The Moon is in the revolutionary sing of Aquarius helping you realize what radical changes you need to make to bring your vision into existence. 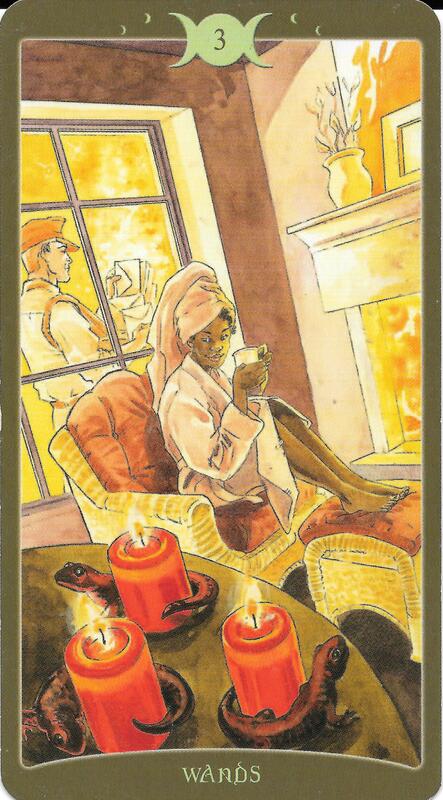 The Judgement card appears when the result of the choices you made are announced. Traditionally, the card features Archangel Gabriel blowing a trumpet to raise the dead to be held accountable for their sins on Judgement day. You’ll want to grab your horn because the Sun enters the bright, shiny, energetic sign of Leo at 2:30 AM PST where he will stay until 8/22/26. When the Sun is in Leo, people call attention to themselves and others notice. It’s time to stand out and own your talents. Despite the joyful energy coming your way, you may feel a little down in the short term with Moon square Saturn at 7:17 PM PST. You may have been judged harshly but know this will pass and resist the urge to beat yourself up about your shortcomings. 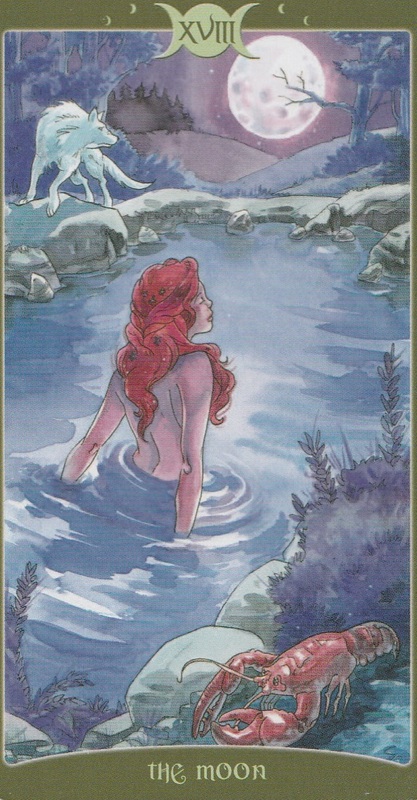 The Moon is in the intuitive sign of Pisces for most of the day so follow your gut and go with your instincts. The number of the day is 2, a number of balance. Mantra: Once we understand the past, we can move into the future. 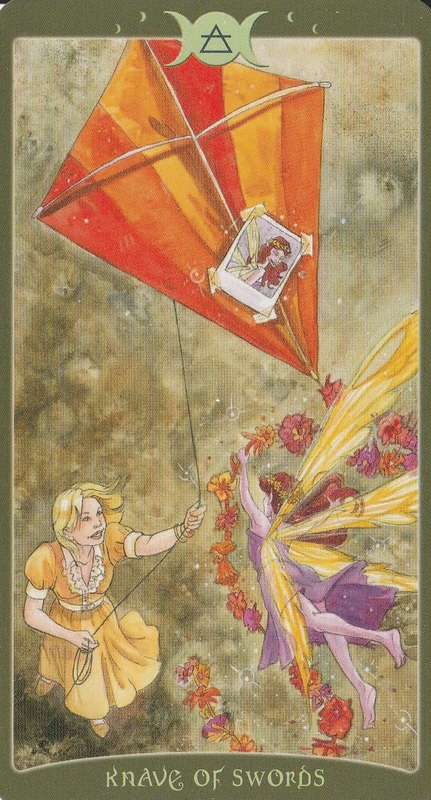 The Star is a card that appears when you are following your dreams. It guides you through the darkness and elevates your spirits. Moon sextile Pluto at 5:08 AM PST could bring intense emotions and primal sexual encounters. This transit has a reputation for being a bit draining because of its obsessive nature so take it easy. Moon opposition Jupiter at 1:25 PM PST could bring out your arrogant, egotistical side but if you keep yourself in check, you’ll be in flow with all the good energy around you. The Moon is in the mysterious sign of Pisces, reminding us of the beauty of the unknown. The number of the day is 3, a number of things coming together. Mantra: When in doubt, look to the stars to guide your way. This entry was posted in art, Astrology, dreams, mysticism, mythology, numerology, occult, self help, spirituality, Tarot, Uncategorized, witchy, Writing and tagged abundance, angels, astrology, card a day, divination, dreams, empowerment, inspirational, magick, manifestation, mantra, meditation, metaphysical, motivational, numerology, occult, pagan, predictions, self empowerment, self help, spirituality, tarot, tarot reading, tarot weekly forecast, wicca, witchcraft, witchy, writing. Bookmark the permalink.